The villages of Zagoria are uniquely endowed with extraordinary natural beauty, a vast temperate forest ecosystem, distinctive architecture, cultural wealth and the sheer romance of an ancient way of life. From the Slavic word meaning "behind the mountains," Zagoria is defined by the Gamila (Tymfi) and Mitsikeli Mountains as well as the Aoos River. It is a part of the massive Pindus Mountain Range that stretches from Albania to Central Greece. The history of Zagorians is shrouded in the distant past. Ancient tribes known collectively as Pelasgians inhabited the area between 2500BC and 2000BC. Old Pelasgic walls have been found in Vitsa, Asprangeli and Skamneli. Little is known about their descendants, the pastoral tribes who lived here from 2000BC to 800BC. Corinthian colonists settled in along the coast of Epirus between 800BC and 600BC but it was not until the 5th century BC that King Tharypas united the Epirote tribes and encouraged the culture of the southern Greeks. A small number of Vlach and Sarakatsani shepherds still practice the dhiava, an ancient tradition of moving their sheep to higher grazing grounds in the summer. The semi-nomadic Vlachs live in villages close to their mountain pastures including some of the villages of Eastern Zagoria. They are of uncertain origin but their language is similar to Romanian and Italian. The Sarakatsani were a nomadic people with no established homes. Today, they live in scattered communities although some Sarakatsani have remained shepherds and still maintain the old customs. Unlike the Vlachs who mingled freely with the Slavs and Bulgars, the Sarakatsani are thought to be among the purest Greeks and descendants of the original pastoral tribes of Homeric Greece. Their annual festival is held at Gyftokambos in Central Zagoria on the first weekend in August. Nestled into the forests on the sides of precipitous mountains, Zagorians prospered during the occupation of the Ottoman Turks because their inaccessibility allowed them to live autonomously. Some became traders and established trade routes through the Balkans to cities as far away as Vienna, Bucharest and Odessa. They constructed an extensive system of pathways to accommodate their mule caravans. Along the road to Vradeto, the Skala of Vradeto can be seen as it winds its way steeply up a cliff. It is an old cobbled footpath from Tsepelovo that passes through a gorge and until recently, it was the only access to the village of Vradeto. Many rivers flow through the Pindus Mountains and in spring, the melting snow made them dangerous to ford. 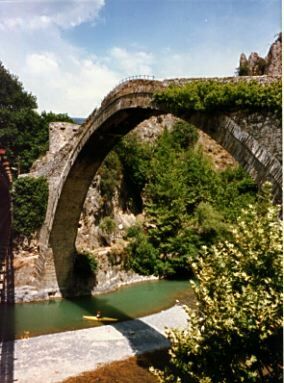 Bridges were essential for keeping trade routes open and Zagoria is uniquely blessed with these graceful, stone structures. There are many lovely, single-arched bridges but the Kalogeriko Bridge near Kipi is especially beautiful with three arches. These old bridges are very narrow and only a low ridge marks their edges. A small bell hung under them to warn travelers of strong winds that could easily toss a man into the angry torrents. The Zagorohoria is best known for its traditional villages with their stone buildings, slate roofs and cobbled paths, all constructed with local stone. At first glance, the simple, austere structures look alike except for differences in size. The similarity ends, however, at the threshold of a house. They are often exquisitely decorated with frescoes, painted cupboards and elaborate wooden carvings on the ceilings. Some of the loveliest two-story mansions are found in Papingo and Monodendri, entire villages that have been declared national historical monuments. Also of interest are the 18th and 19th Century folk paintings that decorate some of the houses in Skamneli. The villages of the northern mountains of Greece were largely responsible for maintaining the Greek heritage during centuries of foreign occupation. 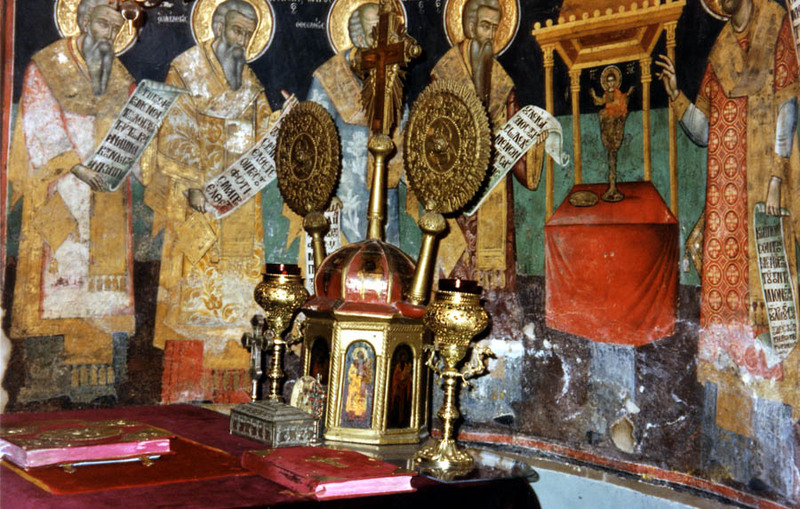 The prosperity of Zagoria under the Turks allowed the culture to flourish and found its expression in the numerous churches and monasteries of the region. Churches were built in the style of basilicas and are characterized by low colonnaded arcades on the sides as well as beautiful frescoes and intricately carved wooden altar screens. Many villages have a church and usually a nearby monastery. One of the most delightful churches is found in Tsepelovo. Some years ago, a wealthy patron provided the funds to have the three hundred year old frescoes cleaned of candle smoke and grime. To everyones surprise, they remain rich and vibrant in color and are considered to be among the best preserved in all of Greece. in the valleys below or even the general bustle of well trodden trails. In this wide open space, the absence of lifes usual stimuli sharpens the senses and with an altered consciousness, endows one with the joy of living each moment. There is a boundless silence and only the distant bark of a sheep dog or the sound of falling rocks intrudes on the utter stillness. The rugged terrain unfolds its beauty slowly and gently for those who pass through in the same way. Majestic peaks soar with a timeless air of watchfulness. Clouds saunter across crisp, blue skies while cooling breezes refresh on the warmest summer day. The rocky places are guardians of tiny, boldly colored flowers that beckon the honey bees. Pure mountain water drips from rocks and small tarns reflect the surrounding splendor. It is impossible to tread these ancient, solitary paths without reflection and one can appreciate why wise Zagorians say that Greeks discover their true essence in these mountains. Remnants of the ancient European forests survive only in Greece, Finland and Sweden, the three most densely forested countries in Europe. Unlike the Fenno-Scandia forests that are mainly coniferous forests, the extensive forests of Northern Greece are comprised of mixed forests with the widest diversity of highland trees in all of Europe. The Vikos-Aoos National Park is a part of Greeces unique patrimony and was established to protect the rare and threatened flora and fauna of the region. The Aoos Ravine and the Vikos Gorge mark its boundaries that roughly encompass Western Zagoria and parts of Central Zagoria. the surrounding cliffs, chamois (Rupicarpa rupicarpa balancanica)graze and eagles and vultures make their nests. A popular route for exploring the Aoos Ravine is to follow the marked trail from the Konitsa bridge to the Moni Stomiou (Stomiou Monastery). The return trip takes about 5-6 hours making it one of the shortest and easiest unguided walks to be undertaken in Zagoria. Lengthier and much more strenuous approaches can be made from the Gamila refuge on the Astraka saddle (8 hrs.) or from the village of Vrissohori. The Vikos Gorge can be viewed for most of its length from the Balkoni tou Vikou (Vikos Balcony). This breathtaking view is well worth the half an hour car ride from Monodendri through deciduous forests and past layered rocks of gray-colored flysch that characterize the villages of Zagoria. A trail from Monodendri descends to the bottom of the gorge and follows the course of the Vikos river through thick forests where beautiful wildflowers and medicinal herbs grow in abundance. About half way, the smaller Mega Lakko ravine intersects the gorge and it is in this part of the surrounding forest that the Greek brown bear may also be found. After about 10 km, the trail emerges from the confine of sheer cliff walls to the Voidomatis Springs (about 6 hrs.) from which the trail forks leading to the villages of Vikos (about � hr.) and Mikro Papingo (about 2 hrs.). 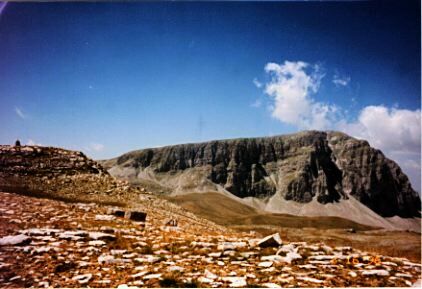 Several peaks of the Gamila Mountains and their seemingly barren upper slopes are included within the borders of the Vikos-Aoos National Park. Legends tell of two dragons who lived in lakes on the mountains of Gamila and Smokilas. The lakes are named after the quarrelsome duo, Drakolimni (Dragon Lake) of Gamila and Drakolimni of Smokilas. They are said to have hurled rocks and trees at each other across the Aoos Ravine and their descendants are supposedly the rare alpine newts (Triturus alpestris) that live in these lakes. 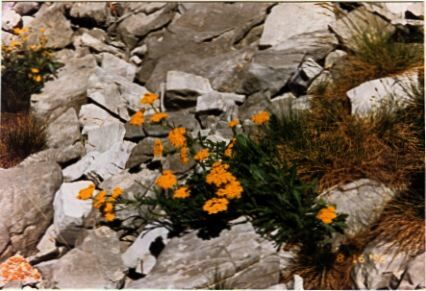 In this alpine zone above the forests where even the grassy meadows have begun to dwindle, a significant collection of wildflowers, some indigenous to the Gamila Massif, are found. The highest peak is Gamila (2,497 m.) and in spite of the perpendicular rock wall of its northern face that overlooks the Aoos Ravine, it is possible to make this ascent on foot. There are several trails up the mountain that converge at the base of the peak. The most challenging is the route from Vrissohori via the village of Neraydovrissi and the Karteros Pass. It is arguably one of the most beautiful climbs in all of Greece, not only for its spectacular vistas but also because it passes through every highland zone with an astonishing diversity of trees, shrubs and flowers. Best Times to Go: Spring arrives late in Zagoria so the middle of April to June offers hikers the most impressive spectacle of profuse wildflowers, full, frothy streams and a wonderland of greenery. Tender blades of soft, fresh grass contrast with the translucence of newly emerging leaves and the strong, dark greens of the firs and pines. In early spring, there is still snow on the ground and temperatures are quite cool. The snow is usually gone by June making it a safer month for exploring the Gamila Massif. July and August are also rewarding because many alpine flowers are in bloom at this time. However, flies are numerous and annoying when passing through the pastures where the sheep graze. September and October are generally more pleasant and the fall colors are exceptionally lovely. July and August are better for those who are more interested in the cultural aspect of Zagoria. Days are warm and evenings are cool. Zagorians celebrate during these warmer months and the main festival of the season takes place from August 15th to the 18th. Generally, the festivals are famous for their songs and dances and merrymaking often lasts until the early morning hours. Each town has its own unique traditions. In Tsepelovo, the festival is concluded with the young people (for only they have the stamina to party for three days straight) jumping into the spring at the edge of town and returning to the square for a final dance. Getting There: The most convenient way to visit Zagoria is by car. Cars may be rented in Ioannina, Thessaloniki and Athens but general availability and the best values are to be found in Athens. From Athens, take the National Highway to Larissa. An excellent primary road travels west from Larissa to Ioannina via Trikala and over the Katara Pass. This portion is an interesting and scenic drive that passes the famous monasteries of Meteora and through gorgeous mountain landscapes. Most of the access roads to Zagoria are located between Metsovo and Konitsa along the main highway from Ioannina to Kastoria. Ioannina is the nearest destination for bus and air service from major Greek cities. Advanced reservations are necessary for those planning to rent a car due to limited availability, especially in August when most Greeks take their vacations. There are daily local buses from Ioannina to the villages of Papingo, Monodendri and Tsepelovo as well as the many villages along the way. A few small Zagorian villages are still accessed only by footpaths. Clothing/Gear: Clothing requirements are seasonal. Summer evenings are usually cool so bring a sweater or light jacket. Good walking shoes are recommended for the uneven cobbled paths of the villages. Hikers require a comfortable day pack, water bottles, good maps, a compass and sturdy hiking boots when trekking in these remote, rugged mountains. Collapsible ski poles or at least a strong stick should be carried as protection against the ferocious sheep dogs that guard the highland pastures. Great distances make camping gear necessary for any serious exploration of the Gamila Massif. Provisions and supplies should be purchased in Ioannina as they may be unavailable in the villages. General Information: Room reservations are unnecessary in the Zagorohoria except during festival time, August 15th to 18th. The Greek National Tourist Organization produces a brochure titled "Epirus" that lists a number of hotels in the larger villages and their telephone numbers. However, the easier approach is to locate the main square, the plateia, ask for a room and you will be directed to the nearest hotel, pension or domatia. Rooms are clean and comfortable and cost about US$50-$75 for a double. Meals may be arranged with your host or at the village taverna. Hiking in Zagoria is strenuous. Most trails up the Gamila Massif are steep and lengthy. Using the Gamila refuge as a base, day hikes can be made to Drakolimni of Gamila, the peaks of Gamila and Astraka and explore the Mega Lakko Ravine. Arrangements for use of the refuge must be made at the EOS office in Megalo Papingo (Tel. 30-265-3041138) or through the EOS representative in Mikro Papingo (Tel. 30-265-3041257). They will also provide information and maps. Plan your itinerary to include the nearby archaeological site of Dodoni, one of the oldest settlements in Greece dating back to 2500 BC and the site of an ancient oracle. If you have the time, a visit to the Valia Calda (Warm Valley) National Park is worthwhile. It is located midway between Vovoussa in Eastern Zagoria and the village of Milia near Metsovo. It is a paradisaical valley surrounded by the peaks of the Ligkos Mountains and heavily forested with pine and beech trees. There are beautiful stands of Scots pine (Pinus silvestris) and the Valia Calda marks their southernmost range in all of Europe. Stay clear of sheepfolds and flocks of sheep when hiking. Inevitably, there will be fierce sheep dogs nearby. Local people say that they become friendly when you sit on your haunches but it is difficult to assume such a vulnerable posture in the presence of these huge, snarling, spike-collared dogs. Hire a guide, especially when hiking in remote, forested areas or the less popular trails. Trails are not always well marked and it is very easy to become lost. Be sure to notify someone of your intended itinerary before setting off into the mountains. Zagorians are among the friendliest people in the world. You will not find the cynicism that sometimes accompanies tourism. Here, visitors are still treated as welcomed guests. Do be forewarned that Zagoria is a place of enchantment. It is a land where time seems to stand still and your visit will always be too brief. Zagoria is one of the areas where the Greek National Tourist Organization has restored and conserved traditional buildings for use as guest houses. For reservations and information about guest houses in Papingo, call 30-265-3041088 or 30-265-3041125. Prices range from US$100-$150 per night for a double. Trekking Hellas offers a 7 day hike in the Northern Pindus Mountains. This trip highlights the Vikos Gorge with turquoise river pools and towering cliffs, stone villages of Zagoria, the deserted monasteries of Agia Paraskevi and Moni Stomiou, the plunging panoramas from the peaks of Gamila and Smokilas and the Dragon Lakes themselves. The Mountains of Greece by George Sfikas is an excellent resource on mountain climbing in Greece. It provides trail descriptions, maps and interesting aspects of history, mythology and folk poetry as they relate to the mountains. It is available in English at the Compendium Bookshop at Nikis 28, near Syntagma Square in Athens. Greece: The Rough Guide by Mark Ellingham, Marc Dubin, Natania Jansz and John Fisher has a good balance of practical and factual information about Greece. The various hiking routes in the northern Pindus Mountains are nicely described. Trekking in Greece by Marc Dubin and published by Lonely Planet provides detailed trail descriptions and maps. This is a good resource if you plan to do a lot of trekking in Greece. However, it should be used as an adjunct to their main Greece guide listed below. Greece: A Lonely Planet Travel Survival Kit by David Willett, Rosemary Hall, Paul Hellander and Kerry Kenihan provides excellent general travel information on Greece. Flowers of Greece and the Aegean by Anthony Huxley and William Taylor is a delightful book for those who are fascinated with the extensive variety of flowers to be found in Greece. Particularly interesting is the chapter that describes the flora of the mountains. It may be ordered through its publisher, The Hogarth Press, 30 Bedford Square, London WC1B 3SG. The Unwritten Places by Tim Salmon describes his solitary wandering of ancient mule paths and summer pastures in the Pindus Mountains. It tells of his participation in the traditional transhumance (movement of animals to summer pastures) with a family of Vlach shepherds with fascinating insight to a way of life that is rapidly disappearing. It may be ordered through the publisher, Lycabettus Press, PO Box 17091, Athens 100 24, Greece. Tel 30 -1 - 647-1788 Fax 30-1-671-0666. Hellas: A Portrait of Greece by Nicholas Gage offers an intimately personal introduction to Greece. It is a fascinating book that should be read by every visitor to Greece. Born in Lia, a village in the Mourgana mountain range near the Albanian border, Mr. Gage devotes an entire chapter to Epirus, the area in which Zagoria is located.